Feature | A steady rain is pelting the roof of Howard Kaeding’s office/shop/time capsule in Campbell, California. “I call it liquid sunshine,” he says with a chuckle. Kaeding, 85, is the first of three generations of California open-wheel racing champions and he’s standing in the middle of the room, next to his beautifully restored white number 3 super modified (originally built in 1969). Kaeding is surrounded by a wide variety of mementos and artifacts from his childhood and 45-year short track racing career, including hundreds of framed photos, racing posters, helmets, trophies, and newspaper clippings, each with a unique story to tell. Driving his infamous number 3 during its eight-year reign at weekly tracks across Northern California, Nevada and Utah, Kaeding won over 125 main events, track championships and driving titles. He won the NASCAR Super Modified championship from 1970 to 1972. 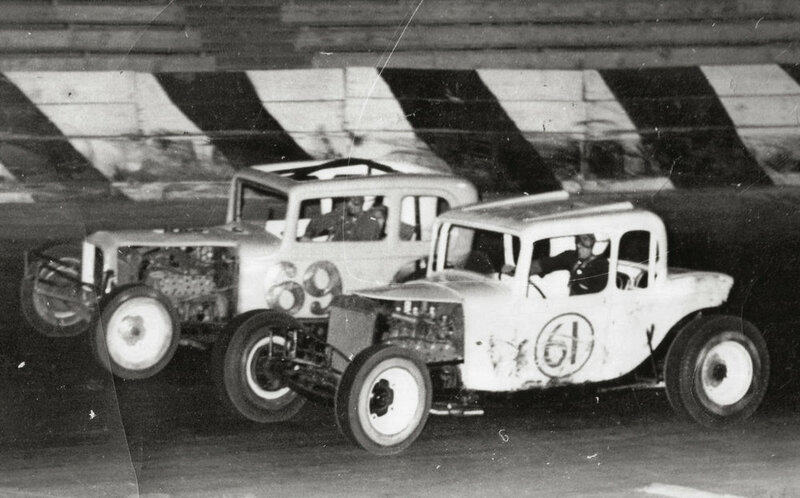 Herb (69) and Howard (61) Kaeding racing modifieds at San Jose Speedway in the early 1960s. What brought your family to California? The Dust Bowl is what brought my family to California. Everybody says it was the depression that brought all the people from the midwest to California but it was the Dust Bowl and the drought. It killed the cattle, chickens and their pets and everything. The people were dying from the dust. My grandfather told my dad he needed to go someplace else and he (grandfather) had been a very successful farmer. He’d gone from the top to down on the bottom. So in 1938 we come out here from Nebraska in a ’29 Chevrolet. My dad with three kids. I was in the third grade and I was six. We slept under trees and behind bushes. My dad would get jobs at ranches and a lot of other different places. He was quite a handyman. And then in ’39 he became a carpenter at Fort Ord during the war effort. We lived out there for about a year. Then we came back to San Jose and all the big factories started making stuff for the war. That’s when all the men had a job and all the women were coming out of the woodwork and becoming welders and all kinds of things. It was the evolution of things, the birth of our nation at the time. But I was just a kid having a good time. I had no idea my dad was poor. As far as I knew, my dad was the richest guy on earth. My folks never had a completed house while I was at home. We lived in a house trailer that my dad built right here on this land (where the current Kaeding shop is located). How do you remember Santa Clara Valley at that time? It was mainly orchards, or something to do with farming. Between Gilroy and Oakland there were probably two to three dozen processing plants: canneries for pickles, spinach, two or three Del Monte plants. Now it’s all electronics. You and your brother Herb both raced; how did you get interested in racing? Well, me and my brother were always together but I was the one to first start with an actual race car. But we always raced on the streets in high school. ... I had a ’32 Ford and here in Campbell on Friday or Saturday night, that was the thing to do. We’d race down Campbell Avenue; back then it was all orchards and long farm roads. I also would drag race a motorcycle (1936 Harley Davidson) and Model A sedan at the old Belmont Drag Strip. I also raced at the Salinas Drag Strip. It was different back then; you just showed up and you did it, just like the street racing. There were no association fees or clubs to join. I just enjoyed it! Howard Kaeding drives his restored super modified at Ocean Speedway in Watsonville during the annual Kaeding tribute race event. Was Herb racing at the same time? My brother started racing about five or six years after I did. He used to help me on my cars some but he was married and had a family. He never went past the eighth grade, he went to work at Westinghouse, got married and had kids and a family. I was two years younger but way behind him in his progression in life. I was the first kid in my family that ever graduated from high school. It was a different time in the world , but we did a lot of great things together. Who were some of your rivals early on? When did you start racing super modifieds? You know, the super modifieds were just developed. You had the hardtops and every year the rules would change. You used to say that ‘last year’s cheaters wrote this year’s rules.’ With the 3 car, it was my creation. I built it in ’69 and raced it for about eight years. It was my thought that I wanted it to look like a dirt Champ car and our group of people built it. What innovation did you bring to your super modified? Yeah, somebody showed me because I never kept record of it, but I think it was like 121 main event wins. Races are won by luck and technology and skill of the driver… and when we raced the 3 car I had everything going for me. And there were some others, Pete Winter’s car was another one; we had a lot of success. And in this period when this car was built, a lot of things (technology) changed quickly. (Nick) Rescino copied this car to some degree. During this time I would drive other cars, too. I drove for Flyer (Tabata), Triguerio Brothers and Bohner’s Boats. I was also driving at Kearney Bowl (in Fresno) with Al Jorgenson out of Sanger. I probably drove for 12 different car owners and probably about half of those guys I drove for about six-10 years. …and you won 17 in a row. Yes, and I actually won 23 races in a row, but they were not all in that car (3). Back then we used to start in the back row. The top point leaders would always start in the back and you transferred in the heat races, but you could end up last in the heat race. But when the main event came up, if you were the point leader, you’d start in the back row and you’d make points for passing. It was exciting to watch ... and did we have good crowds! Three generations: the boys stand for a photo during the 2015 Howard Kaeding Classic at Ocean Speedway in Watsonville, CA, (left to right) Bud, Howard, Brent, Joel and Adam. Did you have aspirations to go racing on a national level? I was never very smart or savvy about the outer world out there as you go along in life. Just like I’d never been to San Jose Speedway until I went there with a car because it cost money to get in. I just had a different outlook on the world. When my dad took us into a restaurant we got a milkshake or a piece of pie, or hotcakes and coffee was a nickel. And he had trouble paying for that—it was a different world for me. Tell me about the history of the Kaeding shop; how did it progress over the years? For me, it started early on with my dad doing his own valve jobs by hand and me helping and learning along the way… and to my first car where my dad taught me how to file rod caps. We were working out of that house trailer that my dad built. It slowly built into a bunch of different stuff. In the early ’60s, we, my brother and I, started doing (widening) our own wheels and sold a couple. The stock car guys would come up from Watsonville and we’d put the steel plate in with their (bolt) pattern. We used to just weld those in the wheels. Most of all the welding was done on the wheels by my brother. I used to pay him $5 per wheel. It was a side job for him. We sold the wheels for $25. And the extra dollars I’d stick into a kitty to build a motor and when we got enough I built this 302-cubic-inch flathead for open comp at the end of the year. We’d also straighten frames. I built a homemade jig and charged 40 or 50 bucks to straighten it out. It was all Okie Joe stuff, but it worked and a guy didn’t have to rebuild a new car. Kaeding poster: Howard, Herb, Joel, Brent, Tim, Bud, and Adam through the years. What do you remember about the fire at the shop? How long did it take you to rebuild? How much are you involved at the shop these days? I do very little. The last year, I’ve been tapering out but I was always the go-for guy. Pick up and drop things off is all I do now. But I’ve been doing less and less. I figure I help ‘em when I stay away (laughs). You raced until you were 65; what made you retire? I was very fortunate. In my last 10 years, I drove for Alviso Rock. He still backs Bud today. I stepped out of the car and let Bud drive it for a couple of races later on in my days and he was doing as good as I was doing. And, I just wasn’t as competitive as I’d like to be. Probably when I started thinking about retiring (from driving) and stuff was when we’d have grudge races at San Jose and I used to race against Brent. I’d maybe win one of them and then when it got to where I wasn’t winning anymore, I started thinking maybe I ought to retire (laughs). It didn’t make me unhappy, I always want my kids to win; you just lose the edge. You have to have that instinct, like a good football player; every tackle he makes, he has to go in for the kill. When the players stop going in for the kill, that’s when the other team starts winning. You can see the shift in a ballgame. What were some of your proudest successes, besides the championships? I think my biggest success in racing has been that at the end of my racing career—and my racing career is still going on—as far as I’m concerned, are the great relationships I’ve had with all the good people and great guys that I drove for. All of the effort that a lot of people made for the love and glory of being involved in racing. Back in the early days, nobody got paid for working on the cars. It was all for love and glory, sort of like the street racers. I have a lot of great friendships today because of racing.